Mickey Sharma is an Indian that was born in Pakistan (its true!!) in 1982 while his father was working for the Indian Embassy. After living in Pakistan, the family moved to Beijing, then Hong Kong, before finally moving back to India in where he lived till 2002 when he moved to Birmingham!! 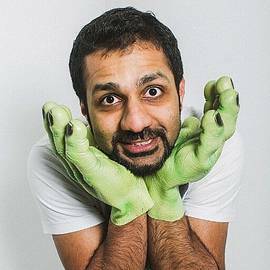 Having endured various jobs like a waiter, shelf stacker, camera assistant and Bouncer, Mickey started comedy in July 09 and now works as a full time comic and travels all over the UK and sometimes abroad (Spain, Romania, India, Czech Republic).